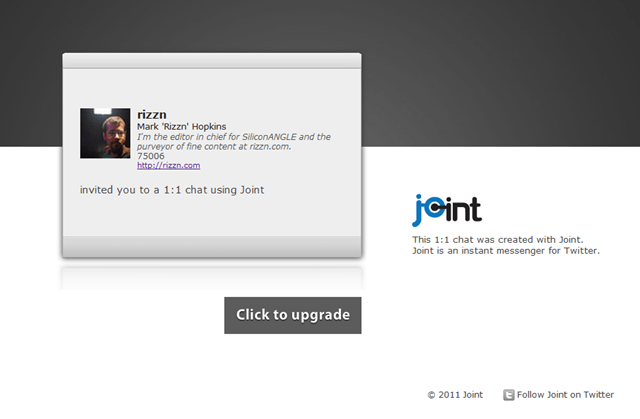 If you’re in the in-crowd of early adopters today, you’re probably playing with Joint, an Air based IM client. It uses Twitter to authenticate, but doesn’t appear to use Twitter’s messaging for communication, from the best I can determine. It’s better than DMs for one on one communication, without a doubt. Despite the many implementations (including Trillian’s latest and most disappointing try), no one seems to have nailed DMs in a way that feels right. It’s unfortunate, I think, that it doesn’t use Twitter as a messaging protocol – it keeps my DM feed clean, I suppose, but it also means that I can’t take conversations to my phone easily, should I go mobile. It’s invite only. Add me on Twitter, then add @imjoint. You should get in that way. Group chat is fun, but doesn’t (yet) offer much over other group chat solutions, other than being trendy and where most of my friends are at the moment. They just stealth launched today, so I wouldn’t hold that against them. It’s stable. No crashes, memory leaks, or lag. Gotta love that. 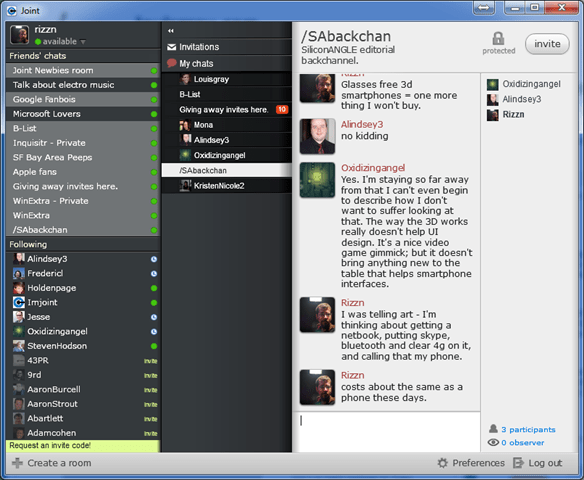 Group chat behaves much like old-school IRC – rooms aren’t persistent, so the last one out turns out the lights. Bottom line: give it a try, if you can get in. Try it now, and you’ll be here before Scoble and MG, so that’s something.